LP Special Release 1976, 2 episodes. Goofs: London sounds to be almost entirely populated by terrified women in episode 1. In response, the military go all-out in episode 2, filling the air with ricochets. According to the Doctor, the lion is the 'undisputed king of the jungle'; he also refers to 'the galactic universe and solar system'. Dialogue Disasters: 'Even my goose pimples have goose pimples'. Continuity: Pescatons have their origins in the carchariidae (the shark family) and look 'half-human, half fish' The Doctor describes them as 'the most voracious and hostile creatures [he's] ever known'. They have the head and body and texture of a shark, with teeth as sharp as nails, fins with claws and glowing slit emerald eyes. On land they move slowly on two webbed feet and tower over humans, can grow a steel-like protective skin, are immune to bullets and the effects of electricity, but cannot endure long periods out of salt water. Pesca, their home planet is perhaps millions of years old, belonging to a dying solar system in the constellation of Pisces. It was once covered by vast oceans, but is now nothing but a wilderness, its oceans vapourising as it nears its [one] sun in a decaying orbit. It supported both marine and terrestrial life and featured snow-capped mountains in its prime. [Of note, earth's sun enters the constellation of Pisces during the months of march and April, which could explain how it was so easy for the Pescatons to reach Earth, given the two planets' close proximity at that time]. The Pescaton civilisation is perhaps thousands of years old, incorporating vast underground saltwater lakes. Space travel is made possible in meteor-like cylindrical craft. Their leader and controller (without whom they cannot survive) is Zor the all-powerful, a larger creature with an enlarged oval head, silver scales and transparent eyes through which a [cybernetic] brain like a great computer can be seen. He has the power to hypnotise others including, possibly, the Doctor. Pescatons, like sharks, cannot endure prolonged high-pitched noise and, unlike sharks, disintegrate after prolonged exposure to it. The Doctor refers to the 'special powers' he has been 'gifted' with [presumably he is referring to his Time Lord powers and his ability to time travel, which is what Zor wanted to exploit to find a new home]. A government underwater expedition has been set up [in association with the eminent astronomer Professor Emerson] to investigate the meteorite landings (there were other landings some years earlier). The Doctor carries a piccolo in his pocket. 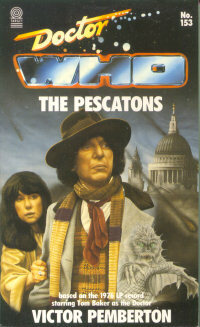 Untelevised Adventures: The Doctor's first visit to Pesca happened [presumably] during his fourth incarnation, during which time he traveled alone. This suggests that it occurred after his first encounter with Xoanon ('The Face of Evil'). The Bottom Line: 'It was an experience I shall not forget. In future I shall travel by bus'. 'The Pescatons', a story aimed at children, still has its own fans who cherish it like a glowing emerald. Charmingly, it features a Doctor who admits to being terrified, awestruck and intensely curious; and who at once fails to recognise the coastline of England. Thoroughly intimate and unashamedly juvenile experience.